Shirts With Random Triangles: Notre Dame Documents Snowy Spring Training In Hype Video. 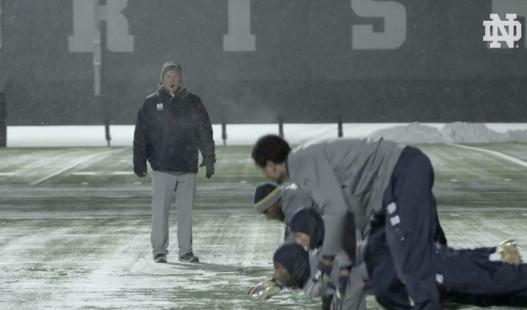 Notre Dame Documents Snowy Spring Training In Hype Video. Notre Dame spring practice. Image via Bleacher Report. It snowed in South Bend, In. last Thursday. That didn't stop Notre Dame from holding an early-morning spring practice session outdoors. The program even documented it for a pretty intense hype video. Become a great football team. It seems only one player was brave enough to practice in short sleeves. The rest were properly attired for cold weather practice. Of note is Notre Dame head coach Chip Kelly's statement that "We gotta go to Texas. You don't think that they don't remember what happened to them? Every day it's in their face!" The Fighting Irish embarrassed the Longhorns 38-3 on Sept. 5 of last year. Notre Dame heads to Austin to complete the current two-same series against Texas on Sept 3, 2016.